THE MILEAGE PROGRAM FOR 2018/2019 HAS MAINTAINED CHANGES AND ENHANCEMENTS THAT WENT INTO EFFECT MARCH 1ST, 2013. The Goal of our Program this year is to log Two Million Miles, collectively, as Frontier H.O.G., "The Riding Chapter." The program is designed for riders to "Ride & Have Fun" and to recognize those who put miles on the road behind them. Our Mileage Program is open and free to current Frontier H.O.G. members. All you need to do is sign up, get your starting and ending mileage read, Chase the Sun and Follow the Wind! 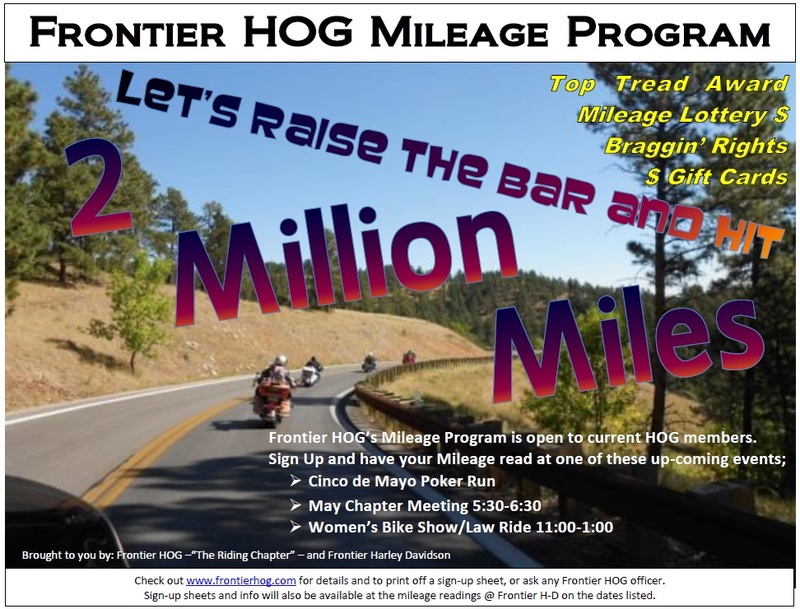 Starting Mileage Reading and Sign Up: May 5th at the Cinco de Mayo Poker Run, at the May 1st Chapter Meeting , and May 12th at the Women's Bike Show/Law Ride. After these events, you can sign up at any Chapter Meeting or Chapter sponsored event, just have a Chapter Officer take the reading. You can also stop by Frontier H-D during business hours and the Frontier Staff we be happy to record your mileage. Ending Mileage Reading: On or before May 11th, 2019 (actual date to be determined). If you won’t be around that weekend, get your bike read earlier. If you are trading or selling your bike, have mileage read prior to sale and then after you get your new bike. Top Tread Award: The rider with most miles wins a set of tires donated by Frontier Harley Davidson. That's right, your Frontier HOG Chapter logged a documented 1.5 million miles in 2008, believed to be one of the first HOG Chapters in the world to do so. Congrats to all who entered! As a reward, a whole bunch of us split up $2,000 worth of gift cards at the Chapter meeting, compliments of your Frontier HOG Chapter and your sponsoring dealer, Frontier Harley-Davidson. This year....Let's DO IT AGAIN !!! !